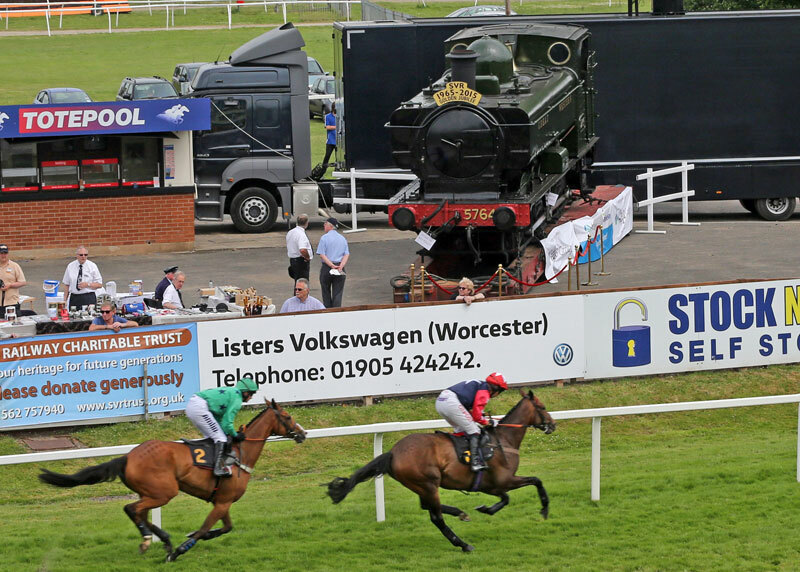 The recent annual Charity Race Day at Worcester Racecourse raised a winning total of £35,000 for the Severn Valley Railway Charitable Trust. The event took place on Wednesday, 24th June and was sponsored by a number of very generous local companies including Thursfields Solicitors, EFG Harris Allday, Nicklins, Redwood Care Homes, West Midland Safari Park, Houghton Edwards LLP and Handelsbanken of Worcester. Over 200 people filled the Severn Suite at Worcester Race Course to show their support for the SVR Charitable Trust and enjoy a fabulous day at the races. An array of extraordinary auction prizes raised just over £9,000, while a raffle raised an extra £3,000. In addition, Worcester Race Course generously donated £3 of every ticket sold. John Leftwich, Trustee and Fundraising Chair of the SVR Charitable Trust said “we were absolutely thrilled by the significant amount of money raised and want to reiterate our thanks to such a fabulous organising committee and all the generous sponsors who worked extremely hard to deliver such a fantastic day”. Whistles will be tooting in celebration on the tracks of the Severn Valley Railway this weekend following news that the attraction has been named the nation’s best-loved heritage site in a national awards scheme. Thousands of people voted for the Railway, which scooped the Heritage Site of the Year title in the BBC Countryfile Magazine Awards 2014/15, it was announced this morning. The much-loved Midlands attraction beat-off stiff competition from some of the UK’s biggest tourism sites; London’s Imperial War Museum, Georgian estate Kew Palace, Welsh architectural wonder Portmeirion and the mystical, pre-historic stone circle at Avebury. The annual awards celebrate the best of the British countryside, with the heritage site category shortlist compiled by television presenter Jules Hudson, widely recognised as the face of many BBC lifestyle and history series including Escape to the Country, Britain’s Empty Homes, Britain’s Heritage Heroes and, most latterly, Countryfile. A life-long history lover, he praised the SVR’s Heritage Skills Training Academy, one of a range of projects funded by the Severn Valley Railway Charitable Trust, saying the Railway has a “fantastic conservation element to it, running an apprenticeship scheme for young engineers in order to keep the traditional skills alive” and adding: “Travelling by steam train is also a wonderful way to see the spectacular surrounding countryside.